It has been my long-held ambition to publish fiction on Spitalfields Life and today it is my great pleasure to introduce this haunting vignette by Sarah Winman author of When God Was A Rabbit, as the first of three Ghost Stories Of Old London specially written for the occasion by Contributing Writers – Kate Griffin & Rosie Dastgir’s stories will follow tomorrow and the next day. December 1930. The first flutter of snow fell with dusk and settled quietly along Fleet Lane and Old Bailey. 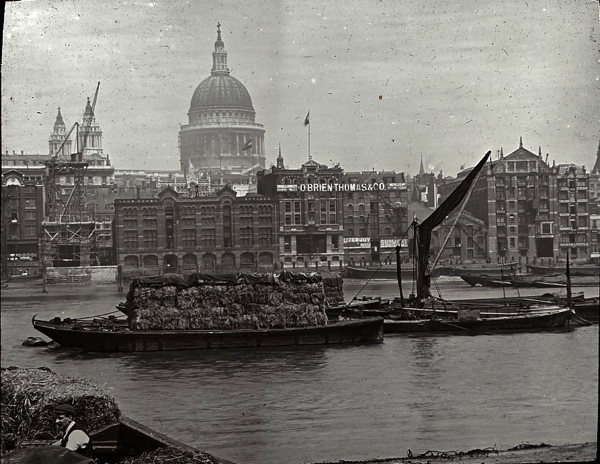 Nobody saw the boy leave the tenement but his footprints were visible as he made his way down to Ludgate Hill, to the warehouses and wharves on the north shore of the Thames. Trig Lane was snowless. 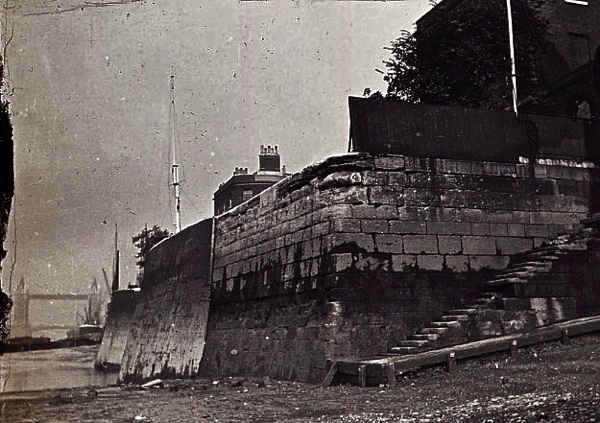 The towering warehouses protected the narrow pass and the boy stood at the top of the steps and let the familiar smell of the river soothe him. The tide was out, the river quiet, the cranes opposite were eerie and still. He was only nine but he looked older because he felt things deeply and was a deep thinker. He listened to the lap of waves upon the shingle and thought it to be the loneliest sound. Like a dog, he heard things that most people didn’t. Sometimes at night, he heard the flick flick flick of ropes against a mast, and sometimes he heard an indescribable sound, a sound that, had he been older, he would have known to be the sound of longing because it lived in the space where his father should have been. Six months before the boy had asked about his father. Your father was a sailor, his mother had said. The boy stepped down onto the snowy foreshore and ran his hand across a barge sunk low in the ooze. He stumbled to the water’s edge where waves lapped at his ankles and rivermud ate his shoes. Now is the time, he thought. Carefully, he took out a boatswain’s whistle from his pocket. His mother had told him it was his father’s whistle and the boy believed her because he needed to. The metal was cold against his lips. He clasped his hand around the narrow tube, placed his finger over the hole, inhaled carefully, and blew. He lifted his finger for another pitch, lowered it, lifted it again until the shrill notes pierced the chill air with their sole intent: You can come home now! And for hours those notes cut across the river to Southwark, to Bermondsey, to the streets beyond, and business slowed as heads rose from tasks, and conversations halted mid-flow, as memory and, for some, the return of melancholy were stirred by that plaintive call. And then a mile west, in Gibbin’s confectionary store, young Miss Jevers suddenly halted the sale of her aniseed balls, when she inexplicably cried out, “Actually, I’ve changed my mind!” and they were left rolling in the weighing bowl, as she shuddered at that unnatural happening, that strange occurrence the day her taste changed, when she chose peppermints over aniseed, and when she would later choose Miss Nevis over Mr Greene. And she would remember that day like a birthday, for that was what it was: a new beginning. And as the notes drifted from the boy’s mouth, so they entered his mother’s heart and took her back to her Past, back down to Wapping High Street and those mossy old steps that glistened with the slap of waves, where she stood, intoxicated, awaiting the shadow of the row boat and the grin of her man and the rough hand that led her up the steep incline, past the laughing singing voices from the Town of Ramsgate, over the cobbled road to the ancient wall of St John’s graveyard, where, giggling through the sacred dark they stumbled towards the broad trunk of a chestnut tree, and there, under the eyes of the Dead, they created life. You can come home now! Onwards and upwards those notes twirled, tripping upon the crested waves as the river grew fat, grew dark and high. And some notes fell upon the wings of gulls and were carried downriver beyond Tower Bridge where the Lightermen paused and doffed their caps as a sign of respect to a song they all knew. And some notes were carried down chimneys into hostels and hospitals, soothing the fractured and whispering to the lonely. On and on the boy played, lost in his song, unaware of the mud sucking at his knees and the water swirling about his neck. Candles were lit across the city and people spoke to those they didn’t know and grievances were forgotten and extra places were laid at tables and hats were raised and smiles replaced frowns and unspoken memories were spoken of once again. And the boy felt warm and never felt the icy blast that swamped his lungs and stilled his heart and never felt the blanket of eternal dark that fell like night because that was the moment when he saw a face, and it was a bright face with a wide grin surrounded by light. And it was his face but so much older. You came home, said the boy. Oh, my. That were a good un! A breathtaking story. Thank you Sarah. Wonderful, evocative and moving. Beautifully written, I look forward the the next two stories. One of the very best of all the excellent posts on the SL blog. Bravo Sarah. Very moving – haunting, melodic, sad but with glimpses of happiness too, all perfectly captured in such a succinct short story. Beautiful. Thank you so much for this and all your blogs. Perfectly judged tale for the winter season, looking forward to more. Very beautiful and dense. The author condensed so much in so few lines of text, which is a great and very rare quality. Thank you. A gem indeed. Well done Sarah Winman. Lovely. I just finished reading a A Christmas Carol to my nine year old son. Perhaps we now have another story to share. Very powerful and poetic. Where do we go for more from this author? Incredibly atmospheric piece, I found it very moving. I look forward to reading more of Sarah Winman’s work. Well done Sarah. Another Gem. held in this story ….. thank you.